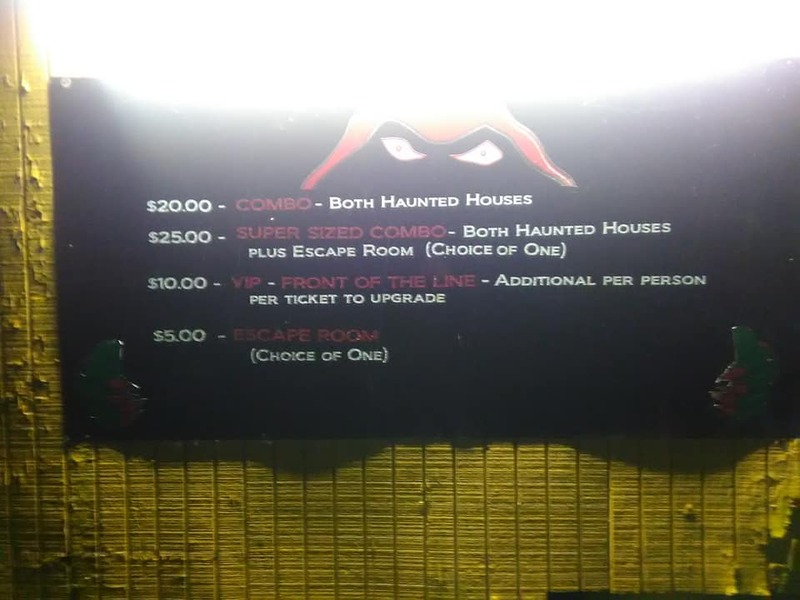 The Haunted Hydro is celebrating their very impressive 29th season this year with three new haunt themes as well as three all-new escape rooms. 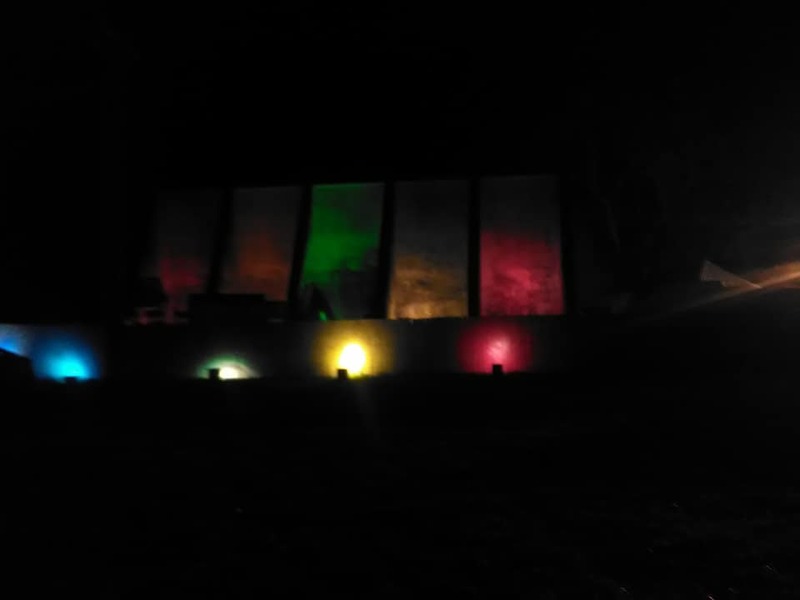 It is situated in the farm country of Fremont, Ohio inside of an old hydroelectric dam. 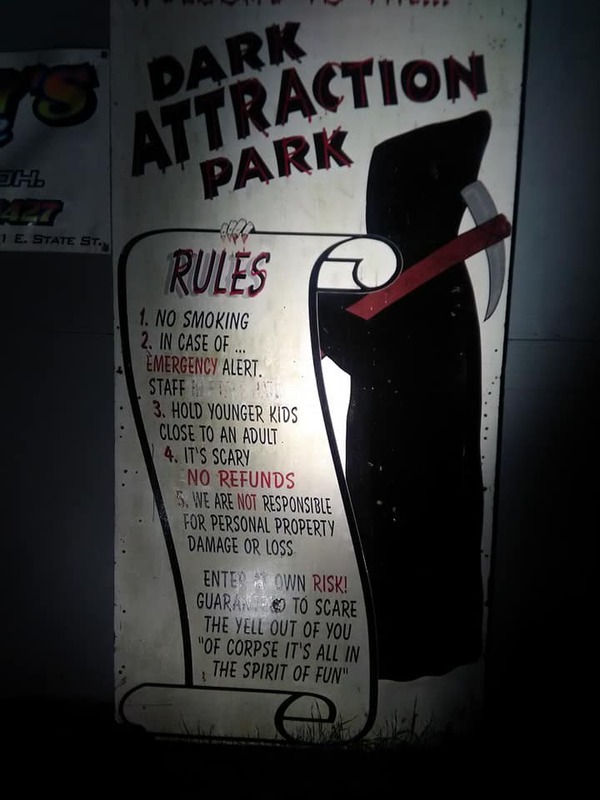 You enter the haunt through a small shack right next to the ticket booth, where a clown shows you their extremely impressive beanie baby collection and explains the rules of the haunt to your group before letting you out into the midway. A professional photographer asks if you want your picture taken against a hand-painted mural, and later in the week you can find that picture on their Facebook page, tag yourself and share. Mysteriously, there is also a little pickle painted on this mural. We did not question the pickle, we just admired it. 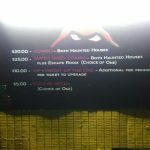 Despite the fact that it was raining and cold that evening, there were a good number of actors in the haunt. There did seem to be a few missing in the woods, most noticeably in their trampoline scene, which was very wet that day. But the actors they did have were interactive and witty. We were especially big fans of a clown we assume is called “Boops,” as he held out his finger to boop our noses with. Touching is a no-no at The Haunted Hydro, but we let Boops know it was ok to give us a boop, and he did and it was delightful. The main building of the Hydro was separated into two themes this year: The Asylum and the Haunted Carnival. Crazy Bob himself greeted us at the entrance and introduced us to the Hydro’s esteemed new friend, an actual human skeleton that rested in a coffin. We want to emphasize that the remains of this person were held in great reverence, respectfully displayed and ethically obtained. The level of enthusiasm inside the Hydro’s Asylum was off the charts. There was a great range of characters, including a child doctor, an evil nun and a crazy cafeteria worker in the process of making the mystery meat. The wide spectrum of character types allowed for some pretty unique dialogue as well, and the actors are not afraid to get creative. There was a good number of actors on the inside of the Hydro, sometimes two in a room, who played well off of one another and also with us. 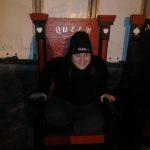 The Haunted Carnival led us back into the night, and while there weren’t a ton of actors out there, they were extremely active and followed us to multiple scare spots. Some were silent and menacing, while others were very talkative and needy for our attention and body parts. Creep was especially cool as a crawling clown. We always appreciate when female clowns aren’t afraid to step away from the “cute clown” aesthetic. The Hydro does a great job at clothing their characters in original costumes. We didn’t suspect that any of them were Halloween Store costumes. Even in the outdoor portions of the haunt, the cold weather clothes the actors had fit seamlessly with the rest of their attire. They are not big on masks at the Hydro, and we didn’t notice any of those on our visit either. The makeups are of high quality and had held up well in the rain at the time that we visited. 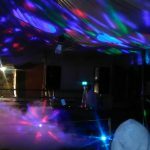 While we didn’t hear any radio ads or see billboards on our way, we know that The Haunted Hydro is well connected to their community. 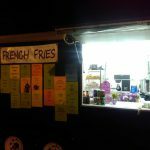 They have a huge number of local sponsors, and tickets are available for purchase at various locations in town to give patrons the opportunity to skip the ticket line when they arrive at the haunt. The ticket booth staff is very friendly, and there are several Hydro-employed security folks stationed in the courtyard. The queue lines are all outdoor but have large tents over them to shelter guests from the wind and rain. 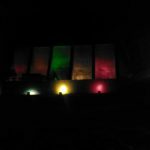 The Hydro itself is a massive building, which is lit with multicolored spotlights. 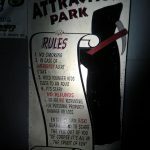 A haunt branded hearse sits up by the road and a massive spider crawls over the midway entrance. Paired with the fact that The Haunted Hydro has had the good fortune to be located in the same place for its whole life, it’s hard to miss. 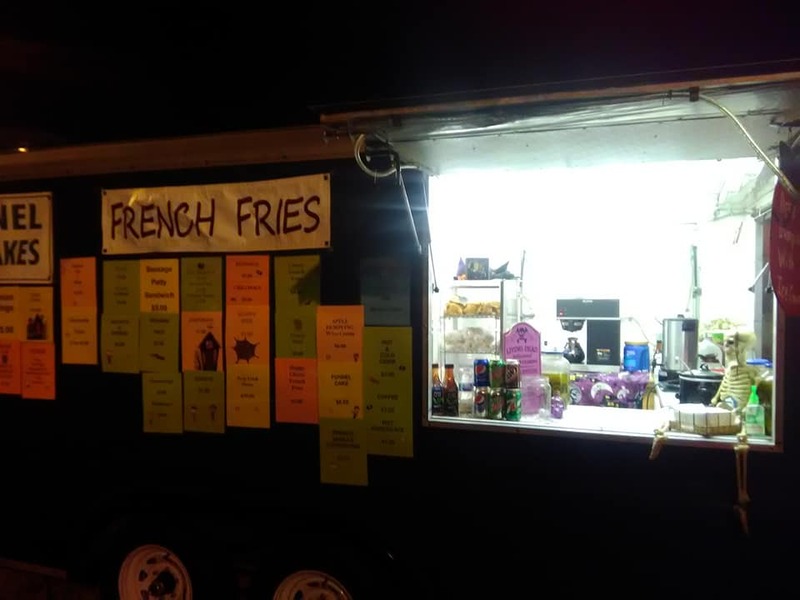 The food truck, souvenir shop and museum were all decorated in rope lights and had a pleasant, Halloween-y atmosphere which kept you in a haunted house mindset as you traveled between activities at the haunt. 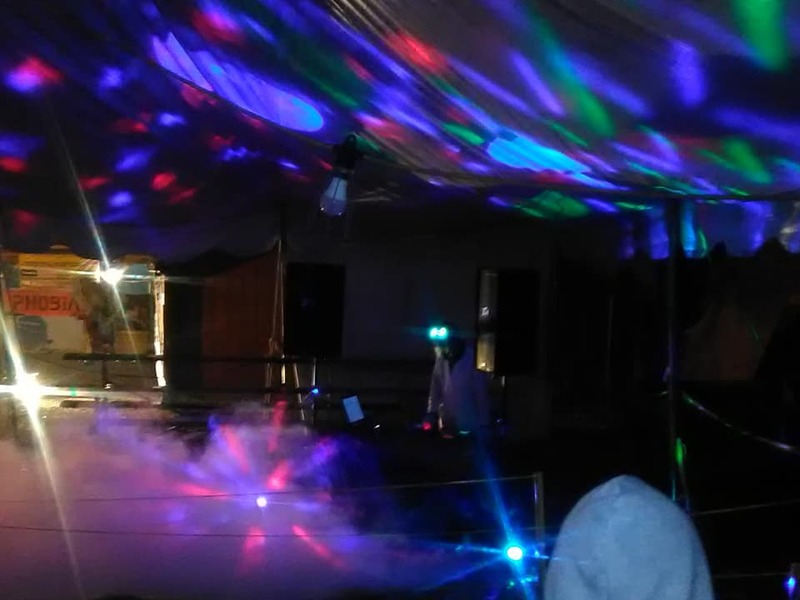 The addition of a live DJ, complete with fog and light show, keeps the energy up as you wait in line to enter the attractions. 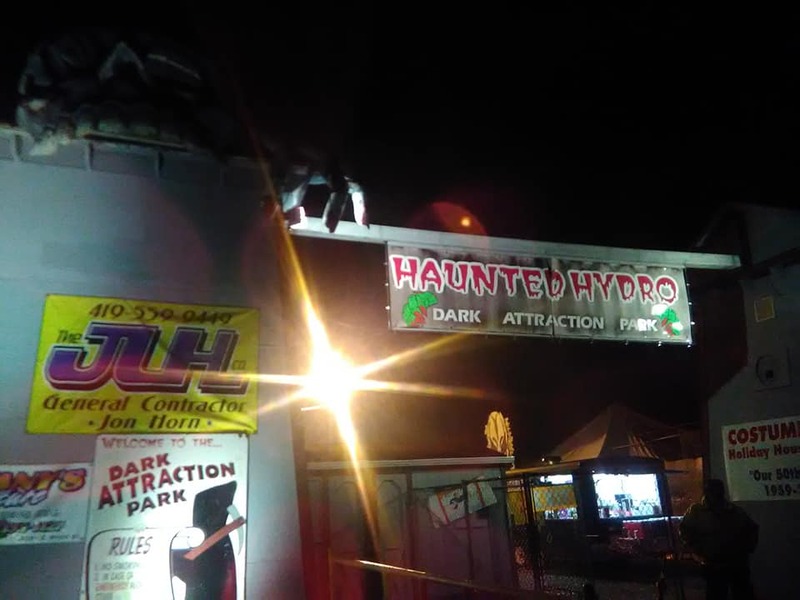 The Hydro tends to favor ambient noise over manufactured sound effects, however, the haunt wasn’t completely devoid of a soundtrack, they were just used very sparingly. Their scenes are well decorated, but some could use just a bit more detail. 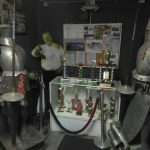 They are very much an actor-driven, old-school style haunt and aside from a few very large props, they don’t have much use for animatronics. The Hydro’s main attraction has been re-themed for the 2018 season and has been split into two separate themes: The Asylum and The Haunted Carnival. The 13 Ghosts of the Hydro are running wild throughout the asylum, threatening to make you a patient in their home. The Haunted Carnival is situated on the grounds of the asylum as a form of entertainment for the patients, and some of them may have disguised themselves as clowns to escape the Asylum’s horrors to pass the terror on to unsuspecting patrons. Vanna Fright’s W.O.O.D.S. 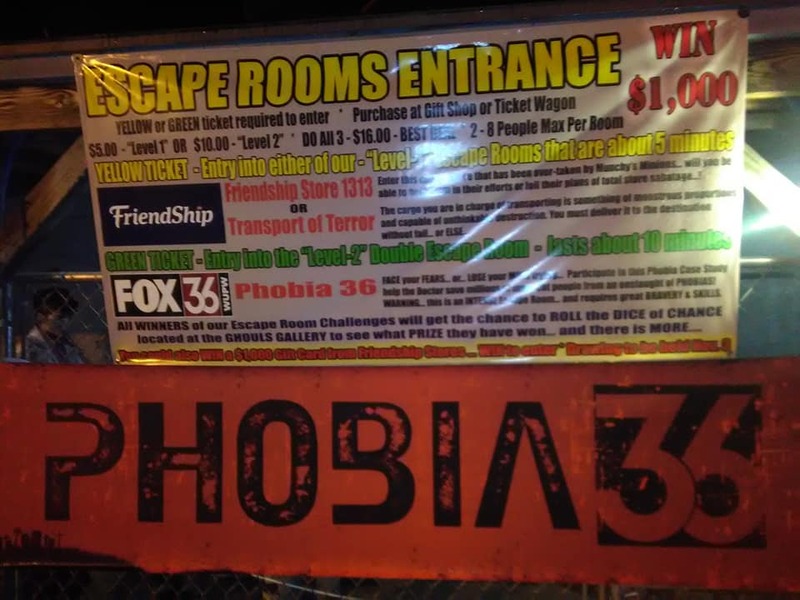 (Warning Only Outcome is Danger and Screams) is a bit more loosely themed, with a sort of “Fear Factor” theme to it. It is presented as a game show, where your life is on the line and the prize for winning is being allowed to leave…with all of your insides. We didn’t really get a game show feel from it though, so this theme was a little lost to us. The Haunted Hydro places its emphasis on “hauntertainment” which, in their case, is a delightfully campy blend of horror and dark comedy. Their actors are well trained and most are not content on just scaring and sooting. They want to have a moment with you and get inside your head. They do make an effort to scare each member of the group, but for seasoned haunt-goers, some of their hiding spots may be a bit predictable. 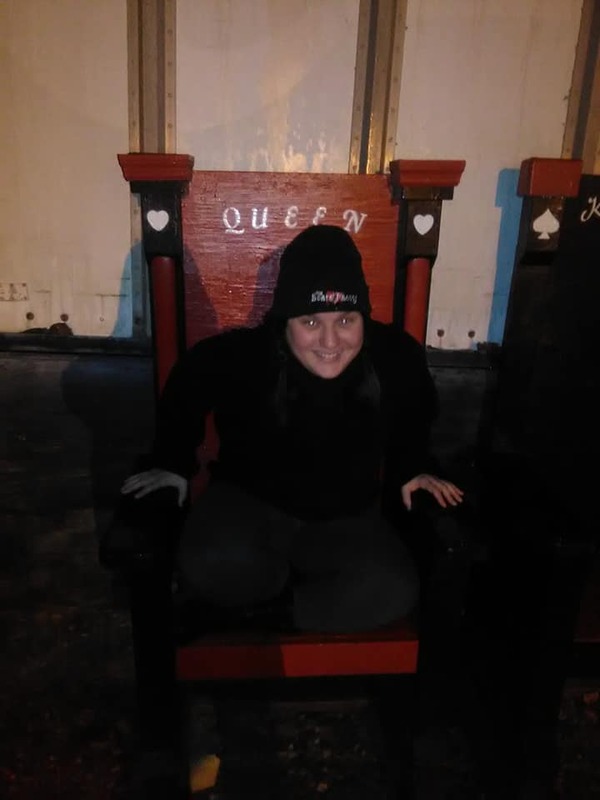 The finales this year were of the tried and true chainsaw variety, but the one set up at the end of the Haunted Carnival was a bit stronger, as it had a one-two punch from out of left field that left Katie high-tailing it out of the attraction! 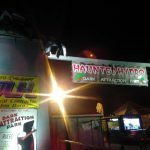 We took our time wandering the Hydro’s haunted attractions and spent a total of about 45 minutes in all three. At a ticket price of $20, that puts your minutes per dollar value at just a bit over two minutes per dollar spent which is among the highest we’ve seen. There are a number of ticketing options available, as well as group rates available for groups of 10 or more. 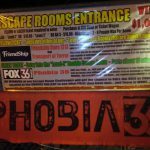 Three all-new escape rooms are prepared for an additional charge, with the possibility of winning free prizes if you escape in time. 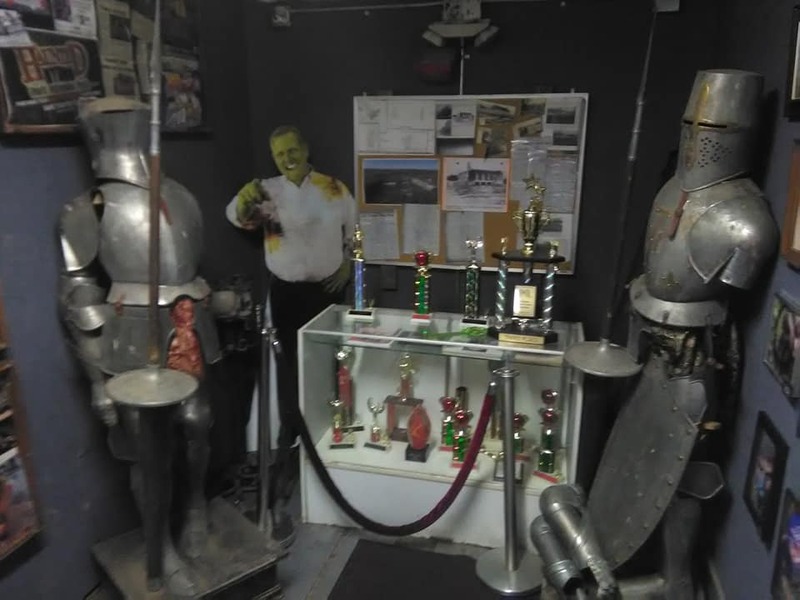 There is a tremendous amount of extra stuff to do in the Haunted Hydro courtyard as well. There was a live DJ in the courtyard as well as multiple photo ops and a free museum chronicling the Hydro’s impressive history. Inside the museum is a gallery wall of photos taken at the Hydro, where you can vote on your favorites. With so much to see and do, it would be easy to make a whole evening out of a trip to the Haunted Hydro.